After a pit-stop at ‘Paper & Cup‘, a coffee and secondhand book shop with a bright, fresh vibe that is a social enterprise from the New Hanbury Project, I headed to Restoration Station’s new shop at 118 Shoreditch High Street. 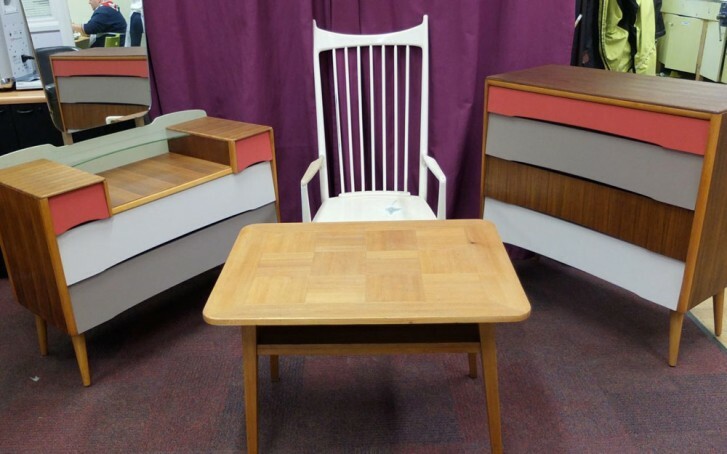 As the name suggests,this latest venture from the NHP restores vintage and designer furniture. The furniture is carefully selected from pieces that have been donated, cleaned, thoroughly prepared and then hand finished. A process that often requires a lot of elbow grease. The chair being worked on in the picture was made of four different woods, oak, beech, pine and ash. It was being meticulously hand sanded before being oiled, waxed and polished to reveal the different wood grains, all under the watchful eye of Bernard, a furniture specialist and volunteer at the NHP. The small team have trained in furniture restoration at the NHP, a Drop-in, Rehab and Training Centre run by the the Spitalfields Crypt Trust to support local people recovering from addiction and homelessness. Furniture restoration and carpentry are two of 20 different subjects taught at the NHP. These skills are bolstered by specialist knowledge in design history, and finishing techniques from local craftspeople that volunteer, such as Bernard looking dapper in an Ally Capellino overall (her shop is around the corner). There are a few pieces available to buy, and they also work on bespoke pieces, such as making a cafe counter. There was a real pride and purpose in the work, so if you have a piece that could do with a ‘make-over’ the Restoration Station would be delighted to help, and add another layer to the story.